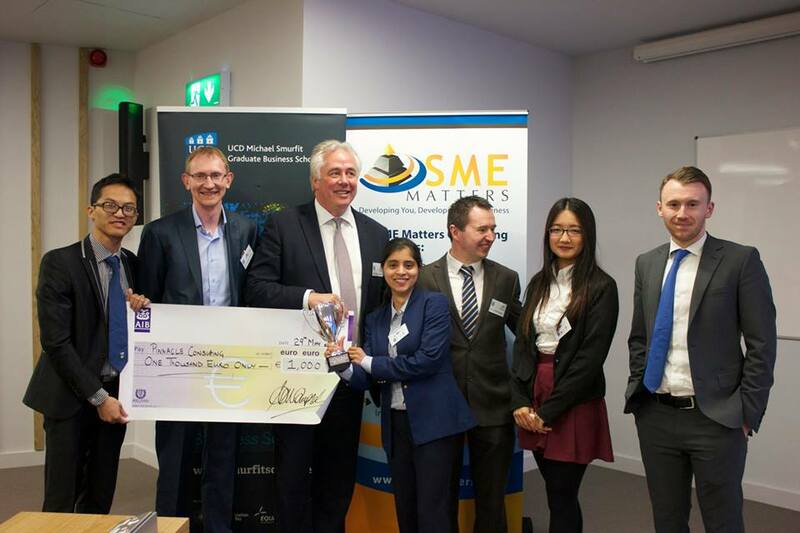 Damien was honoured to be a judge for this year’s Annual Inaugural Case Study Competition for the UCD Michael Smurfit Graduate School Msc programme, which was held on the 28th & 29th of May. The main aim of the competition is to develop students’ analytical thinking, to give them an opportunity to apply and translate the academic skills acquired, by working on real-life problems. They also had the opportunity to get better acquainted with contemporary issues faced by organisations and to develop their skills of working in a diverse team environment. The competition was made up of 9 teams, each consisting of mixed MSc Business streams. There were 3 top prizes, with the winning team taking home the rolling trophy and a cash prize sponsored by Rennicks. 2nd & 3rd places received a cash prize sponsored by SME Matters and ASV Security. “It was such a pleasure being part of the Inaugural Case Study for Smurfit. The standard of teams was no less than I expected and with very little between the teams, which made it a hard competition to judge”, said Damien. “I had the additional benefit of supplying the test case to be used. It was based on a real world challenge facing one of my key clients, Rennicks Sign Manufacturers. My client thoroughly enjoyed the experience and was presented with multiple solutions and novel ideas that they will now bring back to their HQ for further development and implementation” he added. The panel was made up of 6 judges; Andy Campbell (MD Rennicks), Damien O’Brien (SME Matters/Market My Business), Smurfit Alumni and Academic Members of Smurfit. “All of my fellow judges found the exercise extremely practical with the findings having real world application for the case in hand. I’m looking forward to next year’s competition already!” concluded Damien. Congratulations to the winning team, Pinnacle Consulting, whose impressive presentation took home the trophy!